Your organization relies on volunteers to carry out the important work you do and often times interact with donors through fundraising campaigns and community events. Your volunteers are committed to your cause and represent your organization, so it is essential that you engage them effectively at your next event. Have your volunteers encourage text-to-give at your event. Turn your volunteers into fundraisers in a peer-to-peer fundraising campaign. Choose an event that your volunteers and attendees will love. Offer additional creative fundraising opportunities at your event. Reward your volunteers with quality branded merchandise. 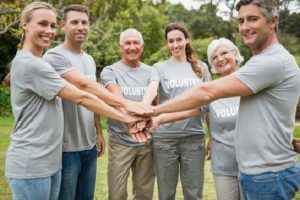 Your next fundraising event provides the perfect opportunity to form stronger connections between your organization and your volunteers, creating relationships that can benefit both you and your volunteers for years to come. One of the easiest ways to engage any event volunteer is to involve them in on-site fundraising via text-to-give or P2P fundraising. .
1. Have your volunteers encourage text-to-give at your event. When your attendees are having fun at your event, they’ll likely want to give again. Your organization can facilitate on-site giving by selecting software that offers text-to-give service, one of the fastest and easiest methods of donation. Your text-to-give software provider assigns your organization the number for your supporters to text. Since your attendees almost certainly have their smartphones with them at your event, post signs featuring the number to text and have your volunteers update your organization’s social media accounts with text-to-give information and reminders. Ensure that your volunteers are well-informed regarding the text-to-give process so that they can help attendees make their gifts. Your supporters’ text the amount they want to donate to your organization’s number. After they text their chosen amount, they’ll receive a link to an automated email that confirms their donation once they send it. To finalize their gifts, all they need to do is send the email! For their first donation, they will need to input some basic payment and personal information. After this, they can choose to save their information, creating an account and eliminating the need to remember login information. The next time they want to donate, they just enter the amount and send the email to confirm their gift. Be sure that your volunteers know that attendees can donate via text-to-give before, during, and after the event. They’ll have fun helping your event attendees contribute to the good work your organization does. 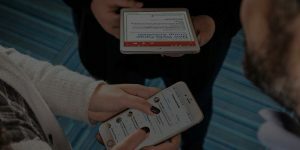 If you want to learn more about this convenient donation method before your next event, head over to Snowball Fundraising for information on the text-to-give process and software. If you have identified volunteers who enjoy taking the lead on event fundraising efforts such as encouraging donation via text-to-give and other forms of mobile fundraising, consider involving these motivated individuals in a peer-to-peer fundraising campaign. 2. Turn your volunteers into fundraisers in a peer-to-peer fundraising campaign. Give your volunteers the opportunity to play a vital role in the fundraising effort leading up to your next event by turning them into volunteer fundraisers for a peer-to-peer fundraising campaign. In a peer-to-peer fundraising campaign, your volunteers create personalized donation pages that express their support for your organization and encourage their networks of family, friends, and social media connections to do the same. Volunteers familiar with crowdfunding will find the peer-to-peer fundraising campaign structure easy to understand. In peer-to-peer fundraisers, however, supporters can give to either your organization’s online donation page or your volunteer fundraisers’ pages. Ultimately, your organization receives all of the donations! Peer-to-peer fundraising has become both popular and successful, due largely to the efforts of dedicated volunteers whose sincere expressions of commitment to their favorite nonprofits’ missions resonate with visitors to their donation pages. Your volunteers also have an advantage in knowing their audience: they understand how to appeal to their friends and followers. Want to make your peer-to-peer fundraising campaign even more exciting for your volunteer fundraisers? Choose peer-to-peer fundraising software that features gamification elements, including badges, trophies, and fundraising thermometers, that show their progress and challenge them to raise more in donations than their fellow volunteer fundraisers. Interact with your volunteer fundraisers over social media in the time leading up to the event by posting updates on who among your fundraisers are in the lead for the most donations raised. You can acknowledge or reward the winner at the event. Peer-to-peer fundraising campaigns are the perfect way to engage your volunteers before the event, but you’ll need their help just as much when the big day finally arrives! Ensure that they are motivated by hosting an event that both they and your attendees will enjoy. 3. Choose an event that your volunteers and attendees will love. Your organization wants volunteers who share in your mission, provide reliable support, and are willing to take on new challenges and responsibilities. Finding volunteers like these in time for your next event is easier when you host a fundraiser in which everyone is excited to take part. Effective fundraising ideas are those that take your attendees’ and volunteers’ interests and needs into account alongside those of your organization. If your nonprofit works with children and families or encourages young people to volunteer, a daytime event on a weekend is likely the best choice so that everyone can attend. Depending on the nature of your organization and the guest list, a dressier evening event such as a dinner or fundraising party may be more appropriate. The time of year is also an important factor in deciding what type of event your attendees and volunteers will want to participate in. Outdoor activities appropriate to spring and summer won’t work as well in the colder weather of fall and winter, when you may wish to consider an indoor evening event instead. Whatever type of event you choose, make sure that volunteers are aware of their responsibilities well ahead of the big day. Well-prepared volunteers will be happier with your organization and more excited about interacting with your guests and encouraging them to donate. When attendees and volunteers are both excited about your event and your organization, opportunities for further donations are bound to arise. Your volunteers will already be prepared to guide your guests through the text-to-give process, but you can also take advantage of the event’s special atmosphere and incorporate additional creative forms of fundraising. 4. Offer additional creative fundraising opportunities at your event. Your attendees expect to contribute a donation upon registration for your event, and it’s likely that many of them already support you through convenient methods like online giving and text-to-give. To make your event even more memorable and encourage additional donations simultaneously, consider engaging attendees and volunteers in a creative fundraising opportunity. Unique fundraising ideas strengthen relationships between your attendees and volunteers and your organization because they encourage interaction and participation beyond the brief transaction of a monetary donation. Asking your attendees to bring donations of items other than money to the event helps them connect with your organization and its mission, while the responsibility of collecting the items and meeting attendees in that process engages your volunteers. One creative fundraising idea, selling merchandise at your event, facilitates interaction between attendees and volunteers and helps spread the word about your organization. Quality branded merchandise should not be reserved for the guests alone, however: these products make great rewards for your dedicated volunteers. 5. Reward your volunteers with quality branded merchandise. Everyone loves to receive a gift, and your volunteers are especially deserving of them after working hard to make your fundraising event a success. You can thank them and recognize their importance to your organization by rewarding them with branded merchandise. Choose a product that your volunteers will be excited to receive. T-shirts are one of the most popular choices, as they can make your volunteers happy and introduce your nonprofit’s name and work to wider audiences whenever they are worn. You can offer them as incentives to both volunteers and supporters who use your online donation tools to make their gifts. You don’t have to wait until the day of the event to reward your volunteers. Motivate their peer-to-peer fundraising competition by offering t-shirts or other branded merchandise to the winning volunteer fundraiser. Alternatively, you can host a social media contest that offers prizes to individuals who sign up to volunteer for your event or are active in sharing your organization’s content with their friends and followers. Engaged volunteers are those who feel connected to your organization’s mission, valued during the process of planning and carrying out the event, and recognized for their work once the big day is over. These volunteers will want to continue their relationship with your organization and are sure to benefit your future fundraising efforts. A team of enthusiastic and hardworking volunteers is central to the success of any nonprofit’s fundraising event. Motivated volunteers inspire donors to give and spread the word about the great work you do, so keep them inspired by providing them plenty of opportunities to take part in planning and carrying out the event as well as thanking them when it ends. 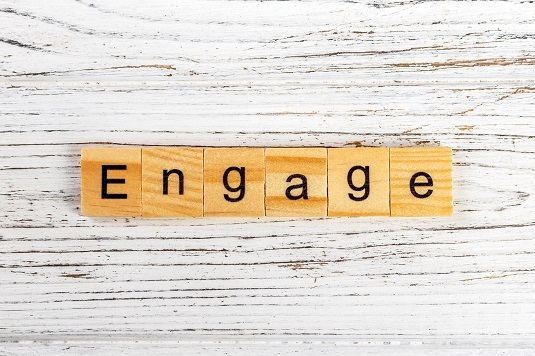 Ready to review your volunteer program to find new engagement opportunities? Download our white paper containing tips and strategies your organization can implement today. John Killoran is CEO of Snowball (formerly @Pay), an exciting new fundraising technology that makes it easy for people to donate in two clicks from text, email, web and social media sites. 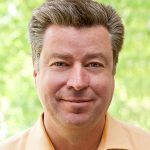 John pioneered SMTP payments and has been a major innovator in the mobile payments space for the past 5 years. When he is not running a company, he is cooking food for his family and telling his dogs to stop barking.